Delicious yet uncomplicated and effortless. This roast delivers a quality meal in just minutes of preparation. I normally show photos of cooked food but seeing the uncooked roast gives you a clear picture of how to wrap the bacon around the roast. In a large roasting pan pour 1 tablespoon olive oil. Rub around the bottom of pan to create a non stick surface. Lay 3 pieces of string 3 “ apart vertically on top of the olive oil. Rub Roast front and back with olive oil garlic powder salt and pepper. Bake at 190c / 375f for 15 minutes a pound. For this roast about 1 hour. 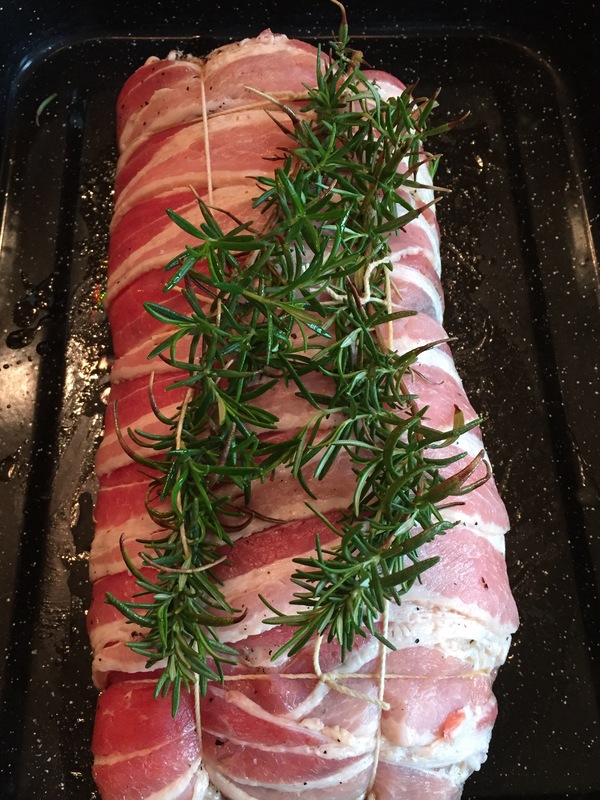 This entry was posted on Wednesday, June 3rd, 2015 at 5:42 am	and tagged with pancetta wrapped pork roast, pork roast.italian pork roast, rosemary, rosemary and pork roast, sundat roast dinner, sundat roast supper, sunday roast and posted in Category. You can follow any responses to this entry through the RSS 2.0 feed.